6-Bedroom Coastal Home For Sale in Edisto Island, South Carolina. A classic example—one of our interval vacation beach homes situated on Edisto Island, SC. Now being enjoyed by its new owners, Beach Music was designed and built to highlight the exceptional beauty that is Edisto Island. 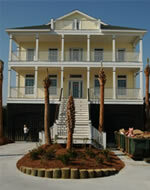 Luxury Beach Home For Sale in Isle of Palms, South Carolina. 3-Bedroom Beach Home For Sale in Folly Beach, South Carolina. An elegant beach home near Charleston, South Carolina, uniquely situated and perfectly designed to enjoy views of both the expansive marshlands and the ocean. Located on the northeast end of Folly Beach, where nature created an island paradise… on one side—wide sandy beaches, breaking surf and steady breezes. On the other—tidal marshes stretching for miles across creeks and river, allowing unobstructed views to James Island, Charleston Harbor, Sullivan’s Island & the Morris Island lighthouse. 4-Bedroom Beach Home For Sale in Sullivans Island, South Carolina. A modern classic beach house embodying the charm and spirit of Sullivan’s Island, in a true deep water locale. On Conch Creek. With private deepwater dock and boat lift. A prime site on Breech Inlet — catching fresh breezes from the Atlantic. Providing exceptional views of the Intracoastal Waterway… perfectly poised for views of dolphins (and other life forms) having fun in the water. 5-Bedroom Beach Home For Sale in Pawleys Island, South Carolina. Resting beach side on a quiet avenue is one of the premier beach houses on Pawleys Island, SC. Sweet Breeze is now a second home its owners will enjoy for years to come. Situated to welcome beautiful vistas of ocean, beach and sky… and crafted to capture the carefree ambiance of Pawleys Island, SC. Created easy to care for and convenient to live in. Fine tuned to enhance everyday activities, family times, entertaining or just relaxing. 6-Bedroom Beach Home For Sale in Pawleys Island, South Carolina. Sometimes, it’s time for “Time Out.” The time when your list of things to do has become far longer than your attention span. That’s the time to kick back in a place perfectly planned for doing just that. A place where you can swim in your private pool that overlooks the creek and the marsh. Sit on your bedroom deck and gaze out at the Atlantic, checking out the unique tapestry of rooftops that is Pawleys Island, SC. Stretch out on your elegant front porch with twin side decks, and indulge in some serious relaxation. 5-Bedroom Beach Home For Sale in Folly Beach, South Carolina. Picture yourself opening your eyes and seeing pure, unobstructed vistas of the Atlantic. Sipping coffee on the upper deck. Walking down the private boardwalk, past your pool, right to the beach, your toes sinking into the soft fluffy sands of Folly. This is not just a dream. It’s real life, in this South Carolina beach property carefully designed for an abundance of good times ahead for you and your family. ©2006 Ourbeachhome, All rights reserved.